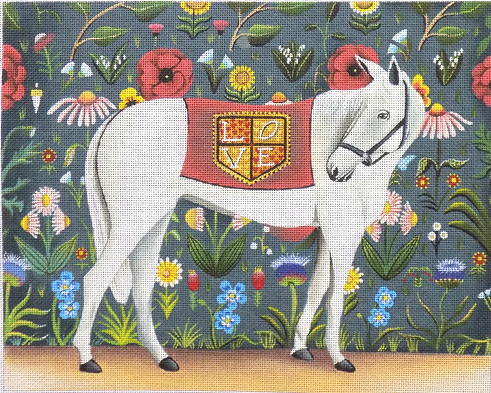 Love Horse handpainted needlepoint by Catherine Nolin is whimsical, floral, fun and so interesting to stitch. The needlepoint design area measures 12.5" x 10" and is hand painted onto 18 mesh mono canvas. Comes with or without fibers - make your choice from the drop-down menu. If you select cotton we will send DMC cotton floss. For wool we use Bella Lusso (use two ply) and silk we use Planet Earth Pepperpot boutique fibers which are single-ply for 18 mesh and easy to stitch with. IF you have lots of thread at home, this canvas is perfect for a partial stash buster. Use your thread for the flowers and contact us to kit the background and the horse. If you require stretcher bars to make a frame to hold your canvas then we recommend a pair of 16" and a pair of 14" and some thumb tacks. Usually ships within 48 hours. Please notify us if you need it within a specific time frame.